As you already know we love testing cat products. It’s actually come to the point where every time I order anything off of Amazon I order an extra cat toy (or two). 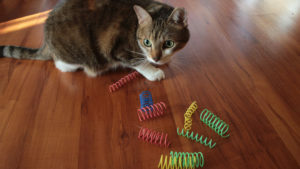 This time around I grabbed the Spring String Cat Toy by JW Cataction which I thought would be a bigger hit than it actually was, but we did get a fair amount of play time out of it. So let’s get cracking and let’s cover what I think of this passive toy. It’s funny because normally I have problems introducing my cats to new toys. Beau tends to pounce or stalk toys slowly to see if the toy is going to attack him and Kalista tends to ignore new toys. Thing is, as soon as I pulled the Spring String Cat Toy out both Kalista and Beau went chasing after it. I dangled it in front of them for a while, which got them running around in circles, but as soon as I put it on the door they seemed to lose all interest. I kept putting Kalista in front of the Spring String and I would wave it around for her to start batting. It worked for a while, she had a good 10-minutes of putting the little mouse in her mouth and trying to walk it away from the door (only to have it bungee out of her mouth.) She did this over and over again until she got bored, but Beau, on the other hand, wasn’t interested in this toy at all (again, unless I was holding it). 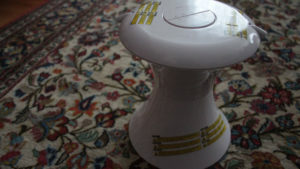 Sadly, in the month and a bit that we’ve had this toy, neither of the cats have returned to play with it on their own. It’s oddly night and day. As soon as I hold it, they come running, but as soon as I put it down they walk away. We recently moved and my office has two beautiful French doors, so I thought I might as well try putting this toy on those doors… and guess what… it worked! After a month of thinking that this toy was useless, Kalista got a second wind for the toy. I guess what I’m trying to say is… location is key. Since I’m usually near the French Doors Kalista will walk by the toy about 4 or 5 times a day, making sure to bat it before she comes in the door. If she hits it in the right way and it keeps springing it holds her attention for some time before she inevitably chooses to come to sit next to me or bite my legs for attention. I tried placing the toy on different doors in the house, but it seems like the French doors are the only ones that will get her attention. 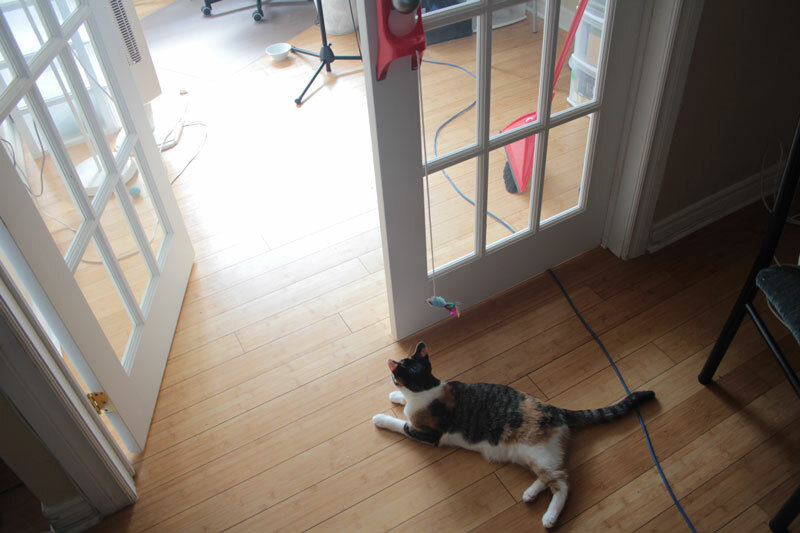 It also makes sense because there’s a lot of space in front of the doors, letting her pounce or run at the toy. Would I say this is a great toy? Not really. 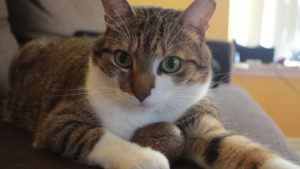 Similar to most other passive toys, there’s a big chance your cats are going to ignore the toy. Now, is it worth a shot? Probably. Kalista has gotten some fun out of this toy. 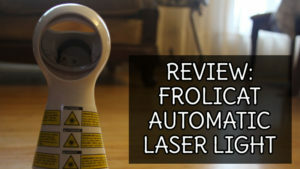 Although I won’t be shouting praises for this toy, I will say that it is fairly inexpensive making it something I wouldn’t worry about spending money on and failing with. Unfortunately, that’s the way it is for a lot of cat toys. You just have to buy a bunch and see what sticks. This toy gets a 2/5. I wish I could give it more because it looked cool, but sadly the cat’s just aren’t feeling it. EDIT 9/9/18 – I have to change my conclusion and give this toy a 4/5. It’s funny because this toy had a very slow burn with my cats, but Kalista has been playing with this toy every night for the past week (and actually about 2-3 times during the day), but I guess the placement is the most important part about this toy. I’m going keep trying to place it in different spots around the house to see what’s the main reason Kalista has taken an interest in the toy, but her play sessions have increased to around 10-minutes per session. I’m so happy to see her getting so much use out of the toy, especially because it’s fairly inexpensive! Hey no problem at all. I may have to change it very soon… looks like Kalista is starting to love it. Just took her a really long time to get into it.